What an incredible article and pictorial. Fans of 3-D and Creature will love reading this!!! 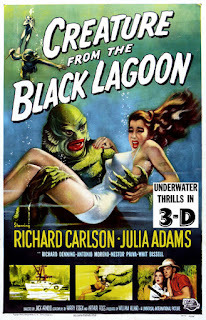 It has been nearly 59 years since CREATURE FROM THE BLACK LAGOON premiered in dual-strip 35mm polarized 3-D. The feature's storyline and the iconic Gillman have been covered elsewhere numerous times and will not be repeated here. Instead, we will concentrate on the 3-D history of this title, and examine in detail how well the original presentation is delivered via the 3-D Blu-ray format. Click on certain images to expand. Arch Oboler’s independently produced BWANA DEVIL had its world premiere in Hollywood on November 26, 1952 and set the box-office on fire. Following the phenomenal success of the first 3-D feature film in color, every studio in Hollywood made plans to jump on the 3-D bandwagon. camera system in January of 1953. Clifford Stine, David Horsley, Fred Campbell and Eugene F. Polito developed a dual-camera rig that, unlike the Natural Vision system which had two cameras facing an angled mirror, placed a pair of Mitchell cameras side by side with one camera inverted. A Selsyn motor was utilized to interlock the focus controls. Two different rigs were built; one for medium/long shots and another for close-ups. Jack Arnold remembered the resulting equipment as a “big monster,” but one that worked perfectly. Filming of THE STRANGERS FROM OUTER SPACE began on February 4 and the production was shrouded in secrecy. The cast and crew signed a "loyalty pledge" stating they would not divulge the nature of the plot. Newly titled IT CAME FROM OUTER SPACE, the studios first 3-D feature opened on May 27, 1953. Composed for the aspect ratio of 1.37:1, it was the first 3-D film projected in widescreen at the World Premiere in Hollywood. Motion Picture Daily wrote, "The screen developed by Universal-International has a 1.85:1 aspect ratio with a textile base, sprayed with an aluminum solution to provide a 4-to-1 light magnifying factor. It is curved on a 90 foot radius." The combination of 3-D, widescreen and three-channel stereophonic sound provided the audience with an immersive experience and effectively ushered in the “New Look” in motion pictures. WINGS OF THE HAWK was their next 3-D production, this time in Technicolor and composed for 1.85:1 widescreen with stereophonic sound. Filming commenced on March 28 and was completed mid-May. At that point, the studio shut down to prepare all departments for 100% widescreen production. 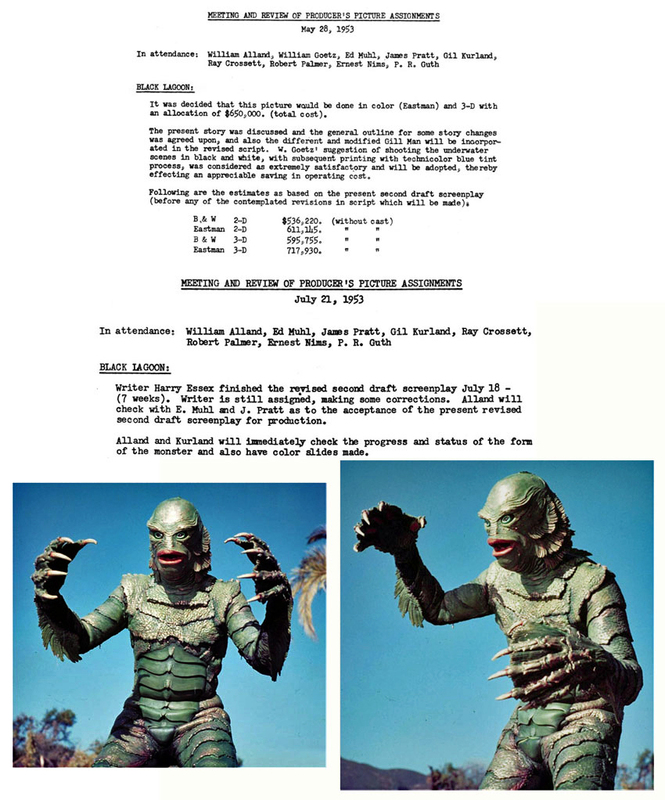 As of May 28, CREATURE was planned for Eastman color as well, with the underwater scenes to be shot in black and white and tinted blue as a cost-saving device. However, when filming began on October 6, the plan had been dropped. Surviving Kodachrome images show how the Gillman would have photographed in color. The studios huge camera rig was not practical for the underwater photography so Clifford Stine devised a unique solution to the problem. Two small Arriflex cameras were placed in a compact, watertight housing. Arriflex cameras were not in wide use in Hollywood in the 1950's; most cameramen felt that such a small camera was not “good enough” for Hollywood films. But Stine was advanced in his thinking, and when he found that the small camera was suited to the job, he used it—with very good results. CREATURE marked the second collaboration between star Richard Carlson, producer William Alland, director Jack Arnold and writer Harry Essex. They had worked well together on IT CAME FROM OUTER SPACE and the studio was hoping that lightning would strike twice. Frank Lovejoy was originally cast in the lead but asked to be let out of his contract to appear in MEN OF THE FIGHTING LADY for MGM. Jack Arnold made the aesthetic choice to place the underwater scenes very deep within the stereoscopic window, giving the viewer a sense of limitless space – and unknown danger – to the Gillman’s underwater domain. Director of Photography William E. Snyder converged various seaweed, fish and flora at the stereo window; being careful they would not leave the screen and enter the theater space. The emphasis was on deep, not “in your face.” The preview trailer made mention of this important aspect to the 3-D presentation. Keep this in mind when we discuss the 3-D image on the Blu-ray. Filming was completed in the first week of November. As the film was in post-production, U-I’s publicity department went to work. 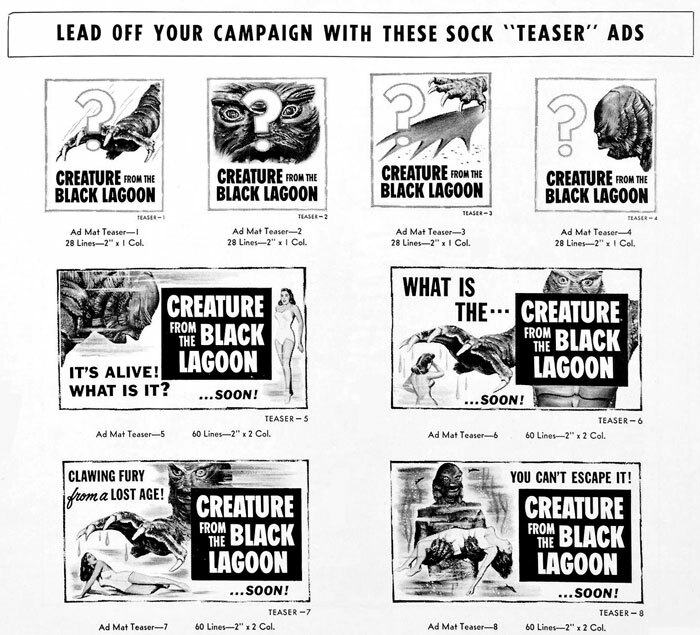 They designed a series of teaser ads which helped to prepare moviegoers for a new type of monster from the studio that had cornered the horror market in the 1930's. They also selected seven scenes from the movie to be used in a View-Master display cabinet utilized in theaters throughout the country. Even though it was promoted in the pressbook, these promotional reels were never issued. Below are the scenes that were selected for the reel. They also prepared a full line of 3-D posters. However, at the last minute, these designs were scrapped and they opted to distribute snipes for the 2-D posters instead. The only original poster to have 3-D text actually printed on it was the 14x22 window card. The first sneak preview was held on January 7 at the United Artists Theater in Los Angeles. 134 viewers took time after the screening to fill out the comment cards and 96 liked the use of 3-D in the film. It's interesting to note that 10 people mention the lack of color. Music cue sheets were prepared on February 2. Herman Stein wrote the Main Title music which includes the famous three-note theme used for the Gillman. Hans J. Salter, Robert E. Dolan and Milton Rosen also contributed to the score which included cues from earlier Universal films MR. PEABODY AND THE MERMAID, CITY BENEATH THE SEA, EAST OF SUMATRA, THE GLASS WEB, RIDE CLEAR OF DIABLO, IT CAME FROM OUTER SPACE, GHOST OF FRANKENSTEIN and THE REDHEAD FROM WYOMING. An un-credited 29 year old composer wrote 12 of the 44 cues in the finished film; his name was Henry Mancini. Milicent Patrick, from the studio make-up department, was tagged “The Beauty Who Lives with the Beasts” and sent on a New York promotional junket to ballyhoo the film. She had designed the Creature and also created the masks used in ABBOTT AND COSTELLO MEET DR. JEKYLL AND MR. HYDE. On February 12, she took part in the gala World Premiere held at the 2,700 seat Broadway-Capitol Theater in Detroit. The following night, CREATURE opened in 3-D widescreen as a special midnight horror show at Butterfield theaters throughout Michigan. The response was overwhelming and far exceeded the studios expectations. Plans were made to distribute the film on a regional saturation basis. The nationwide public got their first view of the Creature on February 21 over NBC in an episode of the Colgate Comedy Hour with Abbott and Costello. While searching in the Universal prop department, Lou encounters the Frankenstein Monster. At the end of the sketch, the Creature crashes out of a wooden crate, giving viewers their first glimpse of Universal’s newest monster creation. By the time CREATURE was ready to hit theaters, interest in 3-D movies had greatly diminished. The reasons are explained in this article, What Killed 3-D? CREATURE was offered to exhibitors in both 2-D and 3-D versions and its 3-D distribution was mixed. Many of the large downtown theaters played it stereoscopically, while the neighborhood and second-run theaters played it flat. As an example, it opened in New York City in 3-D at the 3,664 seat Paramount Theater on Times Square on April 30. When it opened citywide May 20 on the RKO circuit as the supporting feature with the 3-D PHANTOM OF THE RUE MORGUE, it was shown flat. While most of the engagements were shown in polarized dual-strip, CREATURE was the first feature to be shown in some theaters with the Pola-Lite projection lens. In February 1954, Pola-Lite had offered a single-strip lens system to exhibitors (first demonstrated in June 1953) which would eliminate many of the synchronization problems normally found with dual-projector presentations. The left/right images were printed side by side on a single frame of 35mm film in an aspect ratio of 1.75:1. However, low light levels and reduced clarity worked against any potential for success of the system. Universal-International was the first to offer two films in Pola-Lite; CREATURE and TAZA, SON OF COCHISE. An ad in the May 28 issue of Film Daily mentions that Pola-Lite prints were also available for GORILLA AT LARGE, SOUTHWEST PASSAGE and GOG. However, there was little interest in Pola-Lite and it quickly disappeared. CREATURE did very well and was the only stereoscopic feature to have a 3-D sequel: REVENGE OF THE CREATURE began production on June 25, 1954 and premiered in Denver on March 23, 1955. In October 1971, HOUSE OF WAX was re-issued to great success in the single strip, side by side Stereovision system. The following year, Universal made plans to reissue both CREATURE and IT CAME FROM OUTER SPACE theatrically. The plans were dropped and the new prints did not appear in theaters until 1975. Unfortunately, they opted to utilize the anaglyphic red and blue encoding process instead of the far superior polarized system. With anaglyph, prints would typically have varying degrees of crosstalk (ghosting), and lacked the sharpness of the original dual strip prints. Why did Universal perform this visual downgrade on one of their iconic monster titles? Compatibility. Unlike dual and single strip 35mm polarized presentations, anaglyph could be shown on any screen and use any projector. All that was needed were the cheap anaglyph glasses. Looking at this decision from a positive standpoint, a good number of Gillman fans who had missed the original 1954 release were able to see the film in a form of 3-D. The only trade off was the poor quality presentation. I don't think I'd agree with that last statement, but the film did come with a "new plastic lifetime storage case." At least when the anaglyph faded, the print would be well protected. Over the past forty years, Universal has been booking anaglyphic 35mm prints into repertory theaters. However, the prints are usually faded and the quality of the 3-D is greatly diminished. New prints have been struck several times since 1972, but they too are taken from a fading anaglyph negative. In conclusion, the anaglyphic versions of CREATURE are a FAR cry from what was originally seen by theater audiences in 1954. THIS IS CINERAMA had opened to great success and critical acclaim on September 30, 1952. Over the next several months, every major studio was experimenting with some form of widescreen presentation. RCA demonstrated a new widescreen to exhibitors specifically designed for 3-D on March 24. The "New Era of Screen Dimensions" had begun. On February 4, 20th Century Fox announced that all future studio productions would be in CinemaScope. Paramount was the next to announce their 100% widescreen policy on March 24 with Paravision 1.66:1 as their house ratio. 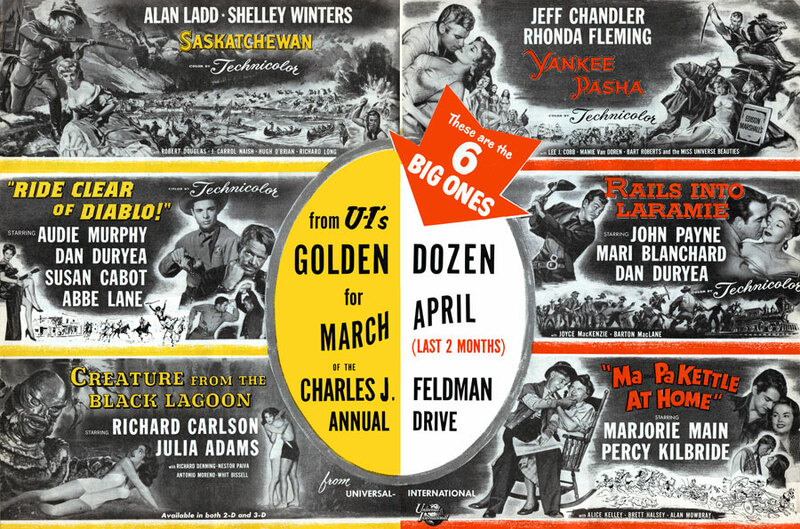 Universal-International went with Wide-Vision 1.85:1 on March 28; MGM with 1.75:1 on April 3; Columbia announced 1.85:1 Vitascope on April 6 and Warner Bros. went 1.85:1 on May 7. The last holdout, Republic, finally went widescreen on August 15. By that time, every studio had abandoned 1.37:1 and widescreen composition, ranging from 1.66:1 to 2.00:1, had become the new industry standard. However, to insure a steady flow of product for all exhibitors worldwide, the films were still protected for 1.37:1 by composing with a view-finder similar to what is shown to the left. Many of these early widescreen films have not been seen in their intended aspect ratios since the original theatrical play-dates. Major theaters began installing the new screens in the summer of 1953. A December 5, 1953 survey of 16,753 operating indoor domestic theaters showed that 80% of downtown theaters and 69% of neighborhood theaters had installed widescreens. In total, 58% of all U.S. theaters had gone widescreen by the end of 1953. The conversion was slow in the Southern and North central parts of the country and that’s why the films were still protected during photography for the standard Academy ratio. Additional information on the dawn of widescreen can be found on this page, Widescreen Documentation. On April 18, Boxoffice reported that Universal was analyzing the 3-D and widescreen trends and any new productions were put on hold. Studio personnel were asked to take their vacations in May. Filming resumed on June 3 with BORDER RIVER and THE GLENN MILLER STORY. The studio had now adopted 2.00:1 as their house ratio and all future productions were composed for widescreen. This policy was applied to shorts, cartoons and newsreels as well. One element that makes the intended aspect ratio of a film like CREATURE so important is the fact that even though directors and DP's were protecting for the standard ratio, they were not always careful. They knew it would only be seen in 1.37:1 in the smaller theaters that had not yet converted. Therefore, some mistakes might appear at the top of the frame, such as a telephone pole which can be seen briefly in the background while they are in the depths of the Amazon. Remember that theatrical widescreen was the primary intent when these films were in production, not the 16mm rental market or future television broadcasts. That's why it is SO important to respect the filmmakers vision and present them in the correct aspect ratio. We were able to provide documentation to Universal which insured that CREATURE was finally mastered in widescreen for this Blu-ray release. 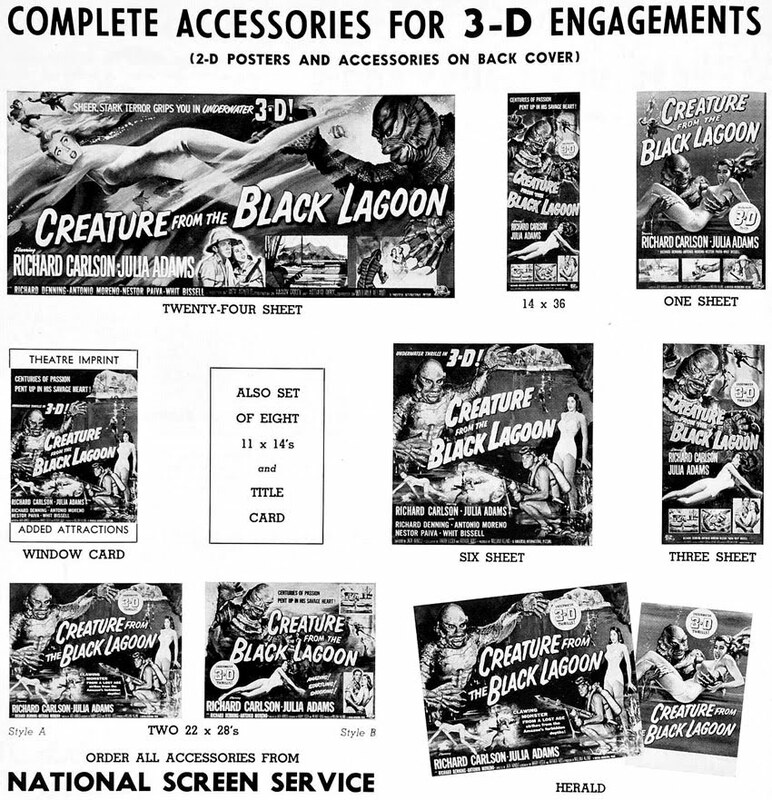 Assessing the overall 3-D presentation of CREATURE FROM THE BLACK LAGOON on Blu-ray is a bit tricky and requires a bit of perspective. Perspective... as in if you have only seen CREATURE in anaglyphic red/blue 3-D, rest assured this is a dramatic improvement. For decades, fans have longed to see it in a superior 3-D version. Now with the recent advances in 3DTV technology and the 3-D Blu-ray standard, we finally have the capability to see the Gillman in high quality / 1080p per eye 3-Dimensions. It took almost sixty years, but we have finally come full circle. One important factor affecting the overall image quality is the use of intermediate footage for fades and dissolves. This dupe footage is edited directly into the left/right camera negatives from cut to cut, thereby eliminating a visual jump in quality by suddenly appearing mid-scene. In other words, the intermediate footage lasts from the scene preceding to the scene immediately following the optical. Some of these shots can last well over one minute in duration. The dupe footage in CREATURE for the opticals has been there since day one. With these factors in mind, this is easily the best CREATURE has ever looked on home video. This is not surprising, given it was culled from the original left/right 35mm negatives and given a 4K per eye transfer. For reviewing purposes, most images from the 3-D Blu-ray are provided from the right side along with two different 3-D viewing options. * Right / Left cross-eyed view: For those who can cross their eyes and view stereoscopic images, this method offers glasses-free, ghost free, light loss free 3-D viewing. 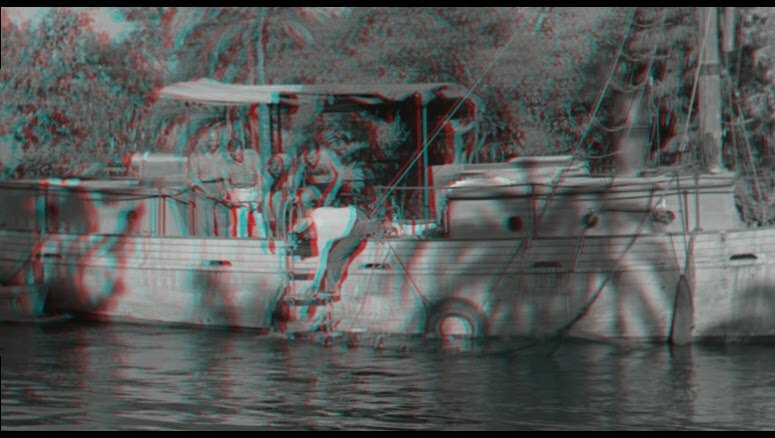 * Black and white anaglyph (red/cyan): This provides a 3-D image that highlights alignment and convergence, as well as some aspects of the left / right panel matching (timing). The blue lens is for the right eye. Please note that CREATURE was NOT released in anaglyph nor is it presented on the 3-D Blu-ray as anaglyph. These images have been created for comparison purposes only. After the initial wow factor subsides, perspective comes back into play. Is this an optimal presentation and is this the definitive 3-D version? Regrettably, it is not. Those who are familiar with stereoscopic photography know that any geometric stereo distortions/misalignment should be corrected. These distortions may sometimes be inherent in the original photography or could be a result of misaligned elements. Depending on the severity, these distortions can often cause eyestrain. 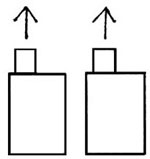 Vertical misalignment is the most well-known 3-D distortion. Human beings view stereo using horizontal parallax, given our eyes are displaced horizontally. But vertical misalignment forces our eyes to adjust in a way they are not normally accustomed to doing. In a worst case scenario, this type of misalignment forces our eyes to move up and down instead of left and right. How well a person can handle these problems depends on both the severity of the distortion and the tolerance of the given viewer. Some are able to handle this eyestrain better than others. In addition, there are other types of 3-D distortions that can affect our viewing experiences as well, making some shots or sequences difficult to view. Quite often, the viewer will have a feeling that "something isn't quite right" even if they don't know what is causing the problem. Sadly, even today's digitally shot main-stream 3-D features still suffer from occasional misalignment errors. The CREATURE Blu-ray often has a number of mild geometric 3-D distortions throughout. Thankfully, they tend to stay on the mild to moderate end of the spectrum most of the time. When these misaligned sections are shown briefly, they can be easy to overlook. However, there are a number of scattered but brief occasions where these issues are much worse. It is worth mentioning again that tolerances for these types of issues will vary from person to person and depend on the severity of the misalignment. But in all cases, these distortions cause your eyes to function in a way in which they are not accustomed to. For this new release, Universal has done a shot by shot re-converging of the entire feature. What this means is where subject material was originally placed in the "stereo window" has now been altered. Sometimes for better, sometimes for worse. Most of CREATURE was originally kept behind the stereo window, with the exception of the obvious "off-screen" 3-D effects. With the re-converging of the entire feature, primary subject matter is now often placed at the stereo window. Possibly it was done to reduce ghosting on those 3DTVs which have less than ideal 3-D cancellation? The issue here is that any stereo window adjustments should be done very carefully, as the original stereoscopic composition is being altered. 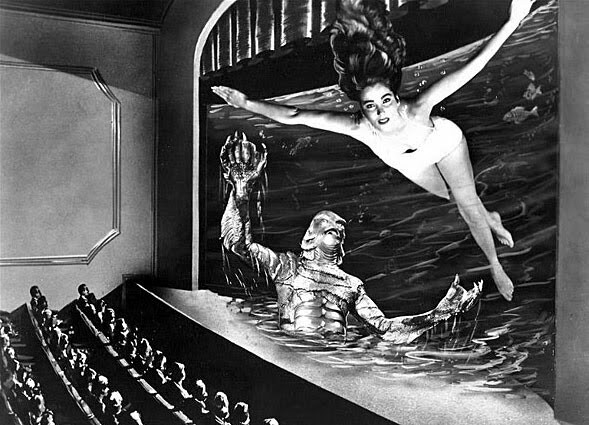 A case in point: In the original dual 35mm 3-D presentations, the underwater scenes were truly DEEP, with divers and Gillman often behind the stereo window. In many of those scenes, bits of seaweed and underwater reeds were placed at or slightly out of the stereo window. In the new Blu-ray, with the underwater scenes now re-converged, the divers are now placed "at" the stereo window, and anything placed in front of them is now thrust outside of the stereo window. And if said reeds or seaweed were already placed out of the window, and the stereo re-converging is excessive, which it was for the underwater scenes, then these foreground effects can now easily cause eyestrain. "Watched some of Creature 3D on Thursday night. The 3D is quite effective, much more so than I remember from watching the theatrical anaglyph presentation in the late 1970s or early 1980s at my school. My problem with it is that it's very much the "poke in the eye" variety of 3D - particularly during the underwater shots where the reeds are pushed way to the foreground while the Creature swims behind them. When things get pushed that much to me in this process, it really is hard for me to watch." At first I thought this reviewer might be more sensitive to off-screen effects as I've read and trusted many of Kevin's previous reviews. But after I saw what had been done to the underwater scenes with the altered convergence, his criticism made sense. Here are two different shots only eight seconds apart illustrating the changes that have been made to the original 3-D convergence. Note how the stereo window was originally placed on the rocks in the foreground. With the new underwater convergence, "deep" is now "in your face" 3-D. In addition, while most of the underwater scenes have now been pushed forward, the above water convergence for certain scenes will suddenly jump far back behind the screen, as though the technician re-converging the film occasionally overlooked a shot or two in the process. There are also cases where (above water) primary subject material is now placed outside of the stereo window when it was originally placed behind the window. In short, the above water re-converging and tracking on primary subject matter is also sometimes inconsistent and not without issues. There are also a few reversed 3-D images throughout the feature which could have been easily corrected. Thankfully, they are brief. If you see any instances of ghosting/crosstalk on your display, please note this is NOT an issue with the original photography, restoration, or 3-D Blu-ray authoring. 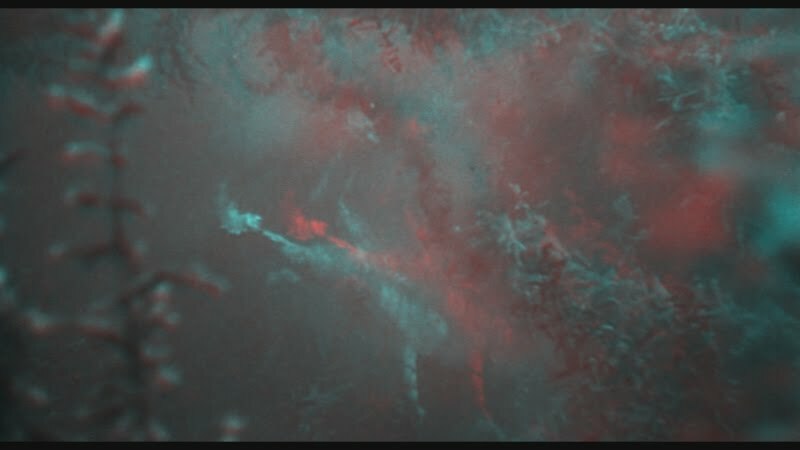 Vintage stereoscopic movies have a much wider - and more natural - parallax, compared to most modern 3-D films which will exhibit fewer ghosting artifacts as a result of minimized depth. Many of the current active display LCD and LED 3DTVs do not meet cinema L/R cancellation levels and as a result, may exhibit "ghosting" with certain more demanding 3-D scenes. Passive polarized displays usually are closer or equal to having cinema grade cancellation levels, while DLP active display devices typically exceed 3-D cinema cancellation specs and are considered essentially ghost-free. Once again, the word that best summarizes the 3-D Blu-ray presentation of this title is perspective. For those that have never seen this film in 3-D, we still give this disc a recommendation. 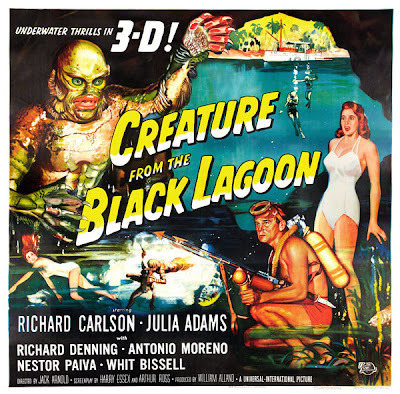 CREATURE FROM THE BLACK LAGOON is a classic which ranks among the finest stereoscopic features of the Golden Age. With that being said, could it have been much better? Without a doubt, yes. Bob Furmanek is an award-winning producer, writer and motion picture archivist/historian. He is available for research and consultation work with respect to 3-D and aspect ratio information. Despite the listing of 3-D posters in the pressbook, they were never issued. Presented here for the first time, unseen in nearly sixty years, are the original 3-D posters prepared by Universal's publicity department.